Preparing to install the F1-3 nose bulkhead, I realized I needed to remove the nose strut in order to apply the BID corner tapes. However, removing the nose strut would mean that I run the risk of changing the width space between the two NG30 panels by a small amount - I would hate to install F1-3 and then not be able to fit the NG6 pivot casting. So to make sure this wouldn't happen, I stuck two pieces of 2x4 in between the NG30 panels (shimmed them for a nice tight fit) and tightened everything up with clamps. This allowed me to remove the NG6 pivot casting while maintaining the correct space between the two NG30 panels. NG6 pivot casting removed... NG30 panels maintaining the appropriate spacing. I used the lines as a guide to make sure everything was level. After making sure everything was aligned, I drilled small holes at the very bottom and inserted two nails - this way everything will self align when I flox it together. And that's how I installed my F1-3 nose bulkhead! Looking really good. 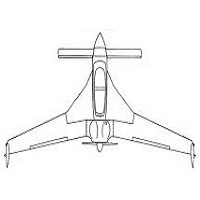 In your CAD model what is the frontal area (area if you were just looking at the fuselage head on) of the airplane minus the wings? Just curious. I took a slice at F.S. 77 (at about where the canopy peaks)... my model shows a cross-sectional area of about 5.41 sq. ft. (including canopy). Fascinating. . .makes me want to build instead of buy! Makes me want to build instead of buy! You make it look so easy Ary! Well, I was taught by the best... some guy named Marco with a crazy Italian accent..